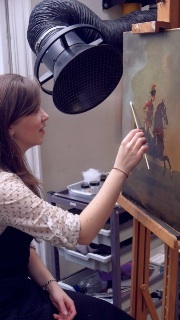 Alysia Sawicka working on David Morier, 'Private, 15th Light Dragoons', c.1760. Although still very much in the early stages of my three-year easel painting conservation course at the Courtauld Insitute of Art, the wealth of information and experience I have obtained already is remarkable. From the basic understanding with which I came to the course, I have gained a real insight into the profession through theoretical and practical training. Armed with this knowledge I now feel confident enough to apply the scientific principles and ethical considerations in making my own decisions, guided and advised by the tutors, in the conservation of my first painting - an eighteenth-century military portrait from the Royal Collection. It is a challenging treatment which includes the removal of a discoloured varnish, the repair of four puncture holes and retouching these areas of damage, it is nevertheless immensely exciting, stimulating and satisfying. The bursary I am receiving from the Anna Plowden Trust has been a huge help, enabling me to cope with the financial burden of tuition fees combined with the high maintenance costs in London. It has given me the opportunity to realise the ambition of pursuing a career in conservation that has driven me for over five years, and so far it is proving to be all I had hoped for and more. 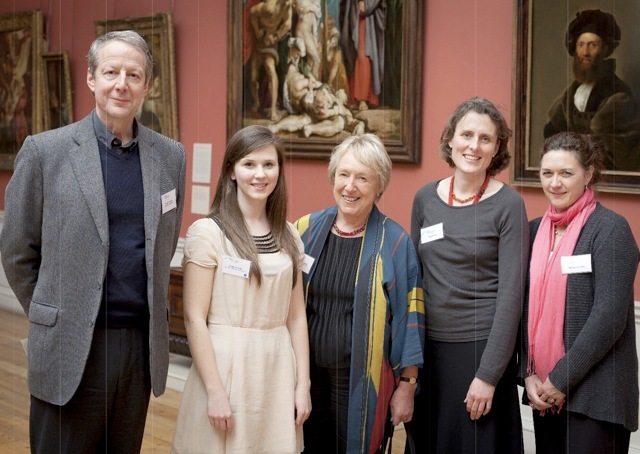 Alysia Sawicka with Trustees Francis Plowden (left) and Jane McAusland (centre).